over the years looking for the word Aquine. well used word before first contact and before Casino Indian? words and signs are being lost to wannabe's! my old EarthLink web site. loyal customers to leave them. I also had to leave them! Again thank-you for coming to my tripod site! This interesting web page was sent to me by a new friend. This is a lot of interesting reading. To my brothers and sisters throughout Indian country. Do you have Bright house cable network? After you find out what they think about our people you may want to re-think this company! A few months ago I wrote a letter to the Bright house cable network explaining the non native use of the words HA! CHIEF! in their advertisements on T V.
After all I did not expect them to know why those words would be so offensive to our people. I did receive a very cold reply saying that they would take it up with their main office. If you will notice now they have tripled that advertisement as if to say that a minority race has no right to tell this large big business how to advertise? So if you have or are thinking on getting Bright house cable T V, Think again! I find many people coming to my web sites looking for the word Aquine. the time they left the New York/Canada Great Lakes area. Aquene, I am not sure of their meaning. I am placing our answer on my web sites. word used time and time again by my elders, now ancestors. However, we were taught our language correctly! everyone you have no weapon! the heart palm up straight out heart high. while meeting someone in passing a friendly Aquai on your way by. with a name Aquine has American native blood! for his abilities to outsmart all who wished him dead. and other Elders and some was from other sources. our monthly meetings, while I was growing up in Uncasvillage. to say that there is any source about him that is perfect. who are neither Mohegan, nor even Native. How can one be an expert without living the story? What is this name Mohegan and where did it come from? was a descendant of Royal Blood. the historical Pequot Village in Connecticut in 1588-1683?? are now the Great Lakes and the Hudson River Valley. Our English name became known as the Monheags. which over time, forced this group of Monheag People East. known as the Connecticut River in what is now Connecticut. then the Dutch and then the French. and the English changed it to Pequot’s. Sachem Wopigwooit was the leader of the tribe. hoping that he would force the English back into the ocean. the English and was at war with them constantly. with Sasscus and the people, but they would not listen to him. on proof that you are related to my family before I send you a map! by young students early in the computer age. or Pau-paus you will never see their staff’s for sacred reasons. Back before first contact we the American Natives from the Eastern woodland tribes had what we called a PAW-PAUS (church). Because of first contact (threats of assimilation) and the lack of non native understanding our ancestors changed the gathering and the name to Pow-Wow (meaning the wicked ones) which now allowed non natives a look see! 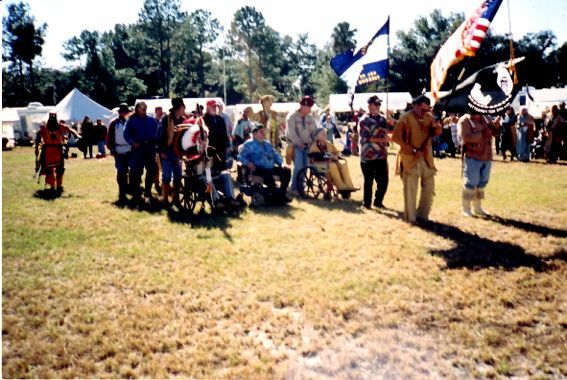 Why is it so hard to understand that Eastern woodland American natives wish for the same respect when it involves our Grand entry and a precious few other dances? No traditional elder wishes to be mean, we have explained that most of our people attending this entry do so with many sacred medicines and or possessions some believe should not be recorded! Please come and enjoy a traditional American gathering we, the elders, would love to teach and guide you through-out and will ever enjoy a dance or two with you. To some native peoples of northeastern North America, a 'powwow' was originally a man with special abilities to cure or offer advice from the spirit world, a wizard, witch, and magician as explained earlier. Everyone is welcome at Powwows! At times there is an entry fee to help pay for the drum, electricity, insurance and so on and you will often find a wide variety of American native crafts, trade goods and food for sale; even demonstrations and storytelling as well. It's a great place for your entire family to spend the day. Drugs and alcohol are not permitted; pets must be on a leash at all times, like at all Paw-paus some powwows invite pets into a circle because Grandfather is Creator of all! The spiritual center or heart of a Powwow is THE CIRCLE; a place to be respected and honored, it is a sacred place that is blessed by Creator through a spiritual leader not by any person. The circle is entered only from the East (where there is an opening) and dancers travel in the same direction as the sun. The singing is a gift and prayer to the Creator; and the drum is the heartbeat of our People. The singers and drummers together are called THE DRUM. Ceremonies start with a "Grand Entry" of the dancers to pay respects to our Creator and to greet one another. Honoring songs, and dances for veterans and our ancestors and a prayer follows. You will be asked to stand and remove your hat for these ceremonies if you can. Please don't take photos or videos if you're asked not to do so; and please don't touch the clothing or personal belongings of anyone in American native dress. Much of what is worn is sacred, expensive and irreplaceable, but do feel free to ask if you want to take individual pictures, or if you have a question about a particular item that someone is wearing. Most traditional Native People will be pleased to assist you if they're asked first. You will see many types of dances at a Powwow. When you hear a 'Round Dance' or sometimes it is called a friendship dance announced, EVERYONE will be invited to participate, so proceed to the East door of the circle and join in. A Round (Friendship) dance is easy to learn and fun to do. How and when to present a gift of tobacco to a Traditional American native? it should be by American native tobacco (Kicnic-kicnic) gift. How much is enough tobacco to present as a gift? How much is not as important as how one gives the gift. remind the receiver that this gift came from Mother Earth. were wrapped in red, why red? Red represents women or Mother Earth. What is American Native Kicnic-kicnic? of thanks to Creator and Mother Earth! First and the most important thing would be to make sure that you are an American native, to find this out ask an elder this elder must contact the Medicine man. The traditional way to make a request to receive your American native name is to give a gift of Kicnic-kicnic, as the request is made, to the person you are requesting the name from. This ceremony as with all Traditional sacred ceremonies should never be performed in public. You and your family must also plan a meal or "feast" to celebrate after the Naming Ceremony is completed. The seeking must be done through fasting, meditation, prayer or dreaming so that the spirits give the name, please remember that an American native name is a name of the tribe that you are seeking the name from and is only spoken at prayer to Creator and the ancestors,. a name like walking with the wolf or standing bear are names spoken around Europeans, if one speaks their American native name in public that person will be shunned by the ancestors! If others are receiving their names, the covered dishes will be shared. Present a gift of tobacco from your left hand to the left hand of the individual you are wishing to receive a name from this means heart to heart. This person should be a person you respect and must be someone who is an American native elder from the nation that you are requesting a name from. Personally ask if you may make a request of this person, either in person, by phone or e-mail. Receive this individual's consent to allow you to make a request. Honor a male and a female with tobacco and request that they stand with you as sponsors at the ceremony. These should be individuals who have made a significant impact in your life and are familiar with that American native nation. At a gathering the Elder person burns tobacco as an offering and pronounces the new name to each of the 4 Directions, everyone present repeats the name when it is called out. The Spirit World then accepts and can recognize the face of the child as a living person. Creator the Spirit World and ancestors then guard the child and prepare a place for him or her when their life ends. At the naming ceremony the parents ask for Elders, four men and four women to be sponsors for the child. The sponsors publicly vow to support and guide the child. Give thanks to the Creator and all the sponsors. if you do that gift will be void by Creator! The question “what are sponsors in naming ceremonies for native Americans” from the City of Sarnia in Ontario Canada, the sponsors are the elders at the four corners of your Sacred naming ceremony circle that stand in for the person or persons asking Creator for the prayer name. Please remember if you still have questions ask them. and insure their royal families. the Clan is based on a matrilineal system. as well as Clan Mothers and Clan Fathers. the Clan as a whole. at the well of the Sachem. A person can also be adopted into a clan (The 13 moon ceremony). Outsiders and helps in the preservation of the tribe. the Europeans also have clans. 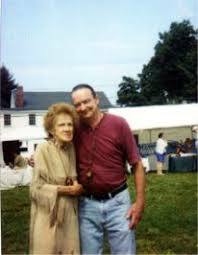 in native country, by phony medicine man! The people of the Turtle. We the Traditional Eastern Woodland Pequot/Mohegan American native people use a 13 moon or month calendar not the English 12 month because, we were taught that Creator charged Grandfather turtle with the responsibility of caring for we his people. The Pequot/Mohegan people (tribe) believe Creator sent Grandfather turtle to be our protector so he set the people onto his back. Because we were safely set on turtles back and turtle has 13 sections on its back we use the number 13 for many of our ceremonies. Like the calendar and the Clan Mother ceremonies. There are 13 sections on the turtles back. There are 13 moons in the Mohegan year. Turtles are also the keepers of time. frogs who signal the plants to grow. 6th Moon of the hot sun---hottest time of the year. 7th Moon Harvest moon---time of the great feasting. the final corn, beans, and squash. 9th Moon Hunting moon---hunting begins. snow arrives, storytelling ceremony time. in the meeting house (longhouses). What is an American native Powwow (Paw-paus)? TREAT OUR NEW RETURNING WARRIORS WITH THE RESPECT THEY DESERVE! Cochegan rock named by European settlers/Cauchegan Rock the true Mohegan name has been over looked for many years now and I liked it that way. 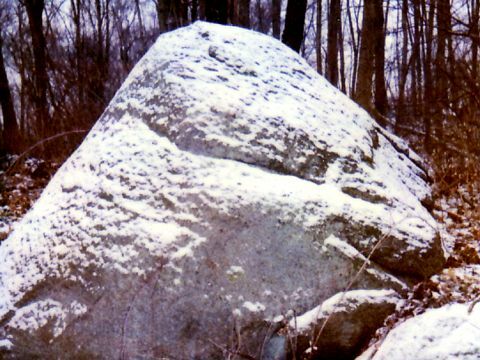 Cauchegan rock (named after a Mohegan relation family of mine that first lived in the village) is the largest rock in Mohegan land. The unique setting of the rock was the main reason that it was used so often as a meeting place by Uncas and his followers. In the spring and for most of the summer, the tribe used it and the land around it, for one of their many villages. Often times, the trees would be used where they stood, to form long and roundhouses. The village was surrounded by fresh water for drinking, gardening, washing, etc., while, the nearby Pequot River provided an abundant supply of fish and clams. The Fox River has now been diverted and used elsewhere by housing development! My Grandfather told me that the tribe would often put tables and chairs on top of Cauchegan rock when they held their meetings. This would also allow them to see anyone coming towards them from great distances, friend or foe. In the colder weather, the tribe would use the rocks and trees in the area to shelter them from the winds. The warmer weather it was a good place for gardening. The first Pau-was of the new season would begin at the rock with fellowshipping, before going on to the Great River, the Quinatucquet River, to Pau-was with other tribes. I have always wondered if it would not be more beneficial for one non-profit organization to share this land with other non-profit organizations and all true native elders. This very sacred land is now being used to help young men learn about and enjoy Mother Earth. the first thing that they mention is the littering. Why not share the land with our elders, as well as with the Cub Scouts, Brownies and Girl Scouts? In this way, more people would be available to help clean it up, and be taught how to show respect for Mother Earth, while keeping it out of the hands of those who would shame Uncas and all of the Ancestors, by turning it into just another tourist attraction. The Sachem Uncas sacred prayer rock village has been turned over to the casino Indians so now we shall see just how long the Ancestors of New England Woodland American Natives beloved Cauchegan Rock village can remain a sacred Mohegan prayer place? are pleased to hear that. to help with your works. so that you can leave me your notes. Who are the Mohegan and Pequot American Native People? came across and down into what are now the Great lakes in the Hudson River valley. and through time forced this group of Monheag people east. ended up along the Quinatucquet River. changed the name to Pequods and the English changed it to Pequot’s. We are almost finished with the boring stuff! while being taught at our monthly meetings while growing up in Uncas village. at war with them constantly. that land they all came together and completely eliminated the Pequot tribe! Lands claim chief for our people. Because of all of the strong statements sent to me from so many people for such a long time now about one of my ancestors, Cousin John Hamilton I feel the need to write in his defense? It would seem that because in his later years with the onset of Alzheimer’s he would put on Eastern Woodland American Native Regalia and a Plains Indian head dress from what is said to be Chief Sitting Bull’s and was gifted to my family by a granddaughter, then jumping on his white horse and riding around New London county claiming to be grand sachem chief of the Mohegan/Pequot people after the crossing of my father Sachem Zeak we forget about all of the good that he has done for my family and our people! My Grandfather made John chief of land claims for life and my cousin John did spend all of that life working for the good of our people; please remember some day you may become sick! The Golden hill Paugussett reservation has been state recognized for century the only reason that it is not federally recognized now is Connecticut’s fear of losing casino money! Moonface Bear, a Golden Hill Paugussett Indian who led a faction of that Connecticut tribe in an armed standoff with state officials in 1993, becoming for a time a symbol of American Indian defiance of authority, died on Tuesday in a hospital in Norwich. He was 35. The cause was leukemia, aggravated by Lyme disease, said his brother Quiet Hawk, the Paugussett's council chief. The 13-week standoff on the tribe's reservation in Colchester in 1993 was ostensibly over the sale of untaxed cigarettes, but it was more than that. Moonface Bear, also known as Kenneth Piper, claimed he could sell tax-free cigarettes under the power of tribal sovereignty. The state, the Federal Government and his own tribal leadership all agreed that the Paugussetts did not possess that power. The Federal Government has not recognized the Paugussetts as a sovereign nation, a status that allows tribes to create on their lands tax-free businesses like tobacco and gasoline sales and casino gambling. Moonface Bear argued that those were innate sovereign rights, there to be claimed by Indians, not granted by outsiders. His cause drew several dozen people from around the country. At the height of the tension, they created an armed camp in the Connecticut woods, with a makeshift lookout tower where guards with rifles watched for the siege they believed would come. Moonface Bear, who claimed for himself the title of tribal war chief, surrendered when he realized the situation was out of his control and spinning toward violence, his brother said. He was represented in early legal proceedings by William M. Kunstler, the civil rights lawyer. After years of legal argument, a judge in Connecticut ordered just last week that Moonface Bear stand trial on charges related to the standoff: the sale of 20,000 unstamped cigarettes and interfering with police business. He entered the hospital on Friday, Quiet Hawk said, after struggling privately with his illnesses for some time. "He thought he was right and everybody was wrong," said Quiet Hawk, also known as Aurelius H. Piper Jr. "He always had a difference of opinion, whether with his father or anybody else who might disagree with him; that was his nature." 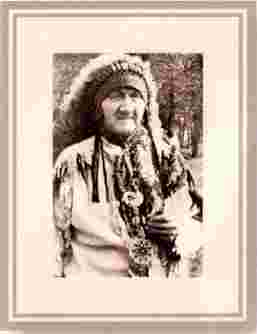 Moonface Bear was one of six children of the Paugussett's chief, Big Eagle. He grew up just outside Bridgeport, on the one-quarter-acre remnant that remained of the tribe's reservation in Trumbull, but was sent by his father to live on tribe-owned lands in the eastern part of the state in the early 1980's. From there, Moonface watched as the nearby Mashantucket Pequot Indians, who he believed had been as scattered by history as the Paugussetts, rose to vast wealth and power as owners of Foxwoods Casino. Because the Paugussetts had intermarried in the black community over the years and had lost most of their Indian culture after decades of being scattered and urbanized, he contended that racism was partly what held his own tribe back. Moonface Bear is survived by his wife, Misty, of Colchester, and by a daughter, Pretty Pony, and a son, Kicking Bear, both of New York City. Of course the Golden hill Paugussett reservation’s like the Pequot’s is now occupied by mixed blood’s from many races of people! Copyright © 1995 - 2010 -Sachem-Uncas.com All rights reserved.